WASHINGTON – Navajo County Supervisor David Tenney told a Senate panel Tuesday that forest thinning is a “smart and responsible” way to curb wildfires and that fighting fires after they’ve started cannot be the only strategy. The hearing before the Senate Energy and Natural Resources Committee came one week after President Barack Obama asked Congress to approve $615 million in emergency funding for wildfire efforts for the rest of this fiscal year. “While I appreciate the administration’s proposal to spend more money on suppression, I would prefer a more fiscally sound way to address rising wildfire costs,” Tenney said. Tenney was one of several witnesses, including senators, forestry and firefighting officials, who said prevention has to be part of the government’s plan for dealing with wildfires. 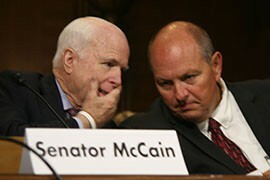 “I’ve watched my home state burn every summer,” said Sen. John McCain, R-Ariz., one of the witnesses Tuesday. “We lost 19 brave firefighters a year ago and over 20 percent of prime forest has been destroyed,” said McCain, adding that there is no higher priority than thinning forests to prevent the reach and intensity of wildfires. 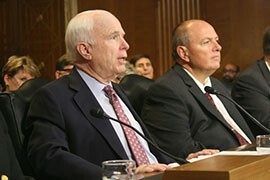 McCain was testifying in support of a measure he is introducing, with Republican Sens. Jeff Flake of Arizona and John Barrasso of Wyoming, that calls for fully funding the U.S. Forest Service’s wildfire budget. Their proposal would amend the Federal Land Assistance, Management and Enhancement, or FLAME Act, which set up a fund to cover the cost of fighting catastrophic fires. Besides easing the procedures to get firefighting funds, their bill would also direct the Forest Service to use a new wildfire budget forecast system and promote the use of private industry to help the service thin forests. Obama’s request, included with an emergency border funding request, dealt mostly with firefighting, but also asked for authority to respond to wildfires like any other natural disaster, to speed funding and stop the current cycle of “fire borrowing,” or tapping other budgets to pay for fire response. 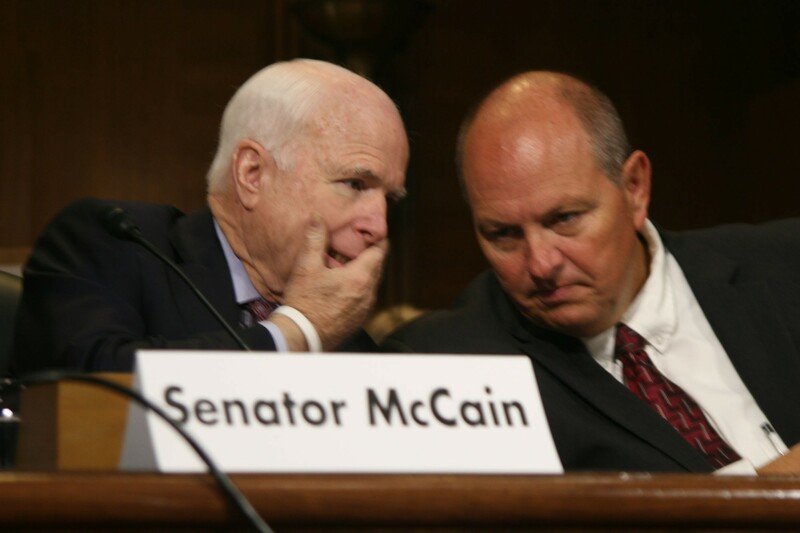 McCain said although he agrees that catastrophic fires should be budgeted like other natural disasters, his proposal would fully fund fire suppression to prevent the practice of fire borrowing. Tenney said the “key ingredient” to managing forests is private industry, and that sawmills in Arizona predict a timber shortage later this year. “We spend way too much time and money on putting out burning trees instead of cutting them and putting them to good use,” he said. The San Juan Fire burned 7,000 acres and cost $6.5 million to contain – or $932 an acre, Tenney said. But it would have cost just $128 per acre to study, prepare and sell the land for treatment, he said. “Acres of treated forest is better than 7,000 acres of nothing,” Tenney told the committee. Sen. John McCain, R-Ariz., left, talks to Navajo County Supervisor David Tenney at a Senate committee hearing on wildfire preparedness. Both men testified that firefighting efforts should be focused on forest thinning rather than just suppression after the fire breaks out. 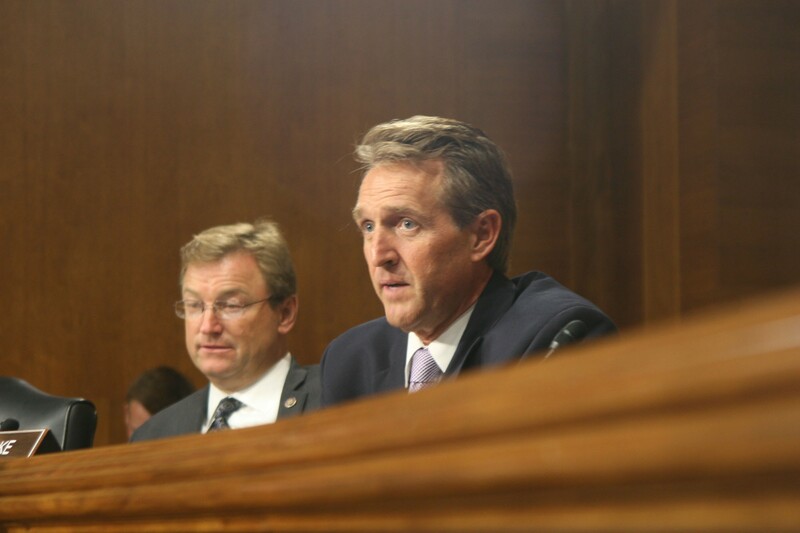 Sen. Jeff Flake, R-Ariz., at the Senate Energy and Natural Resources Committee hearing on fire preparedness. 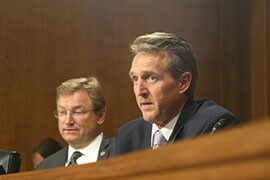 Flake and Sen. John McCain, R-Ariz., are co-sponsors of a measure calling for fully funding the U.S. Forest Service and Interior Department's budget for wildfires. 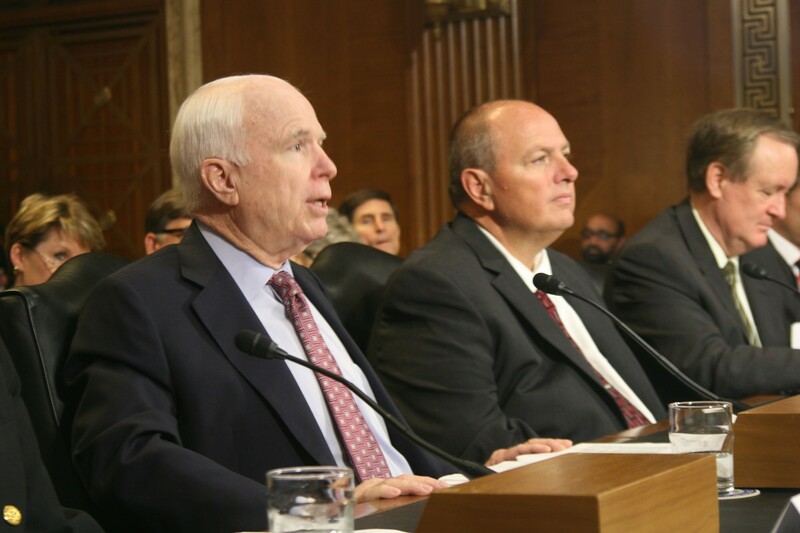 Sen. John McCain, R-Ariz., left, told the Senate Energy and Natural Resources Committee that, next to water, wildfires are a dominant issue in Western states and wildfire funding needs to be addressed. Testifying with him is Navajo County Supervisor David Tenney.